All photographs in this gallery were made in 2005. 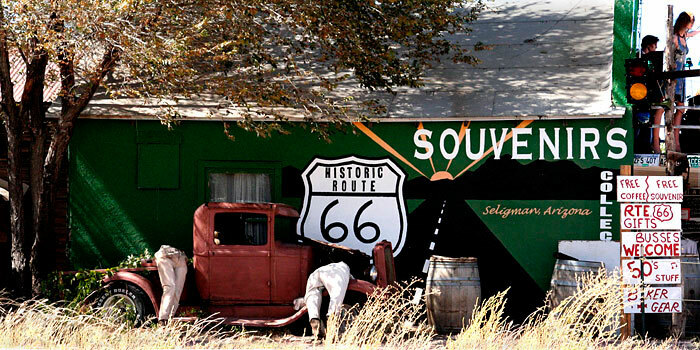 US66 was authorised in 1926 to link together east and west coasts, passing through small towns like Seligman, Arizona. A tarred surface replaced gravel through the town in 1938 but the Interstate 40 by-passed it in 1978. 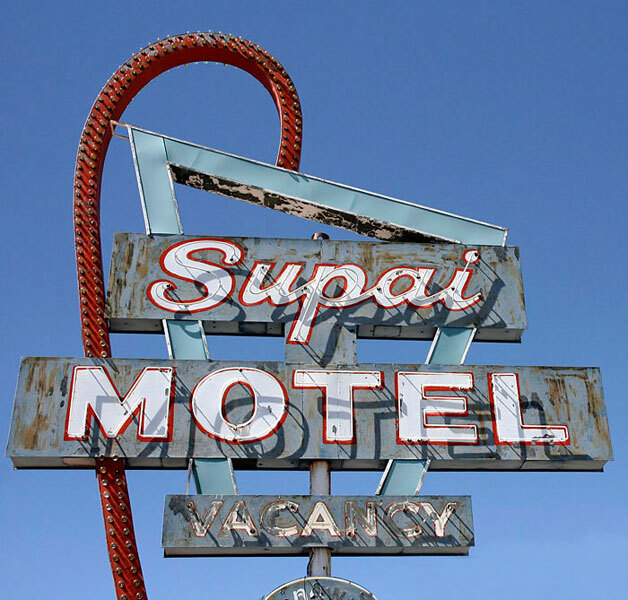 The Supai Motel was built in the early 1950s and renovated in 2008. In 1882 Seligman was originally 'Prescott Junction' on the Aitchison, Topeka & Santa Fe Railroad. It was re-named after the New York railroad financier Jess Seligman in 1886. 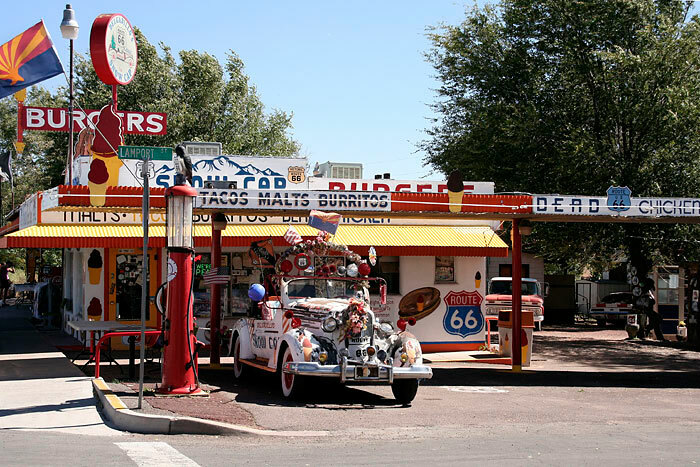 For decades the town relied on the Railroad and Highway for its prosperity: now Route 66 tourists are a mainstay. 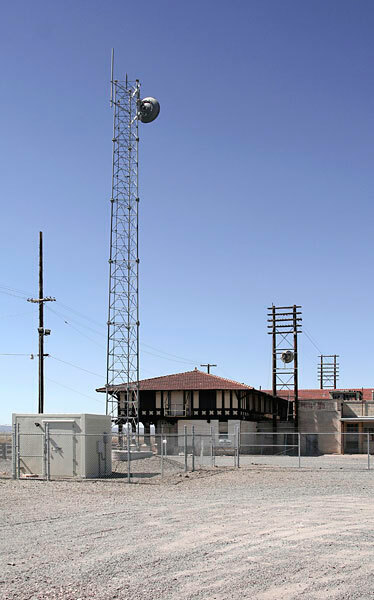 Seligman was an important maintenance depot on the ATSF Railroad route from Chicago to Los Angeles and its passenger trains called until 1971. Amtrak's 'Southwest Chief' no longer stops. 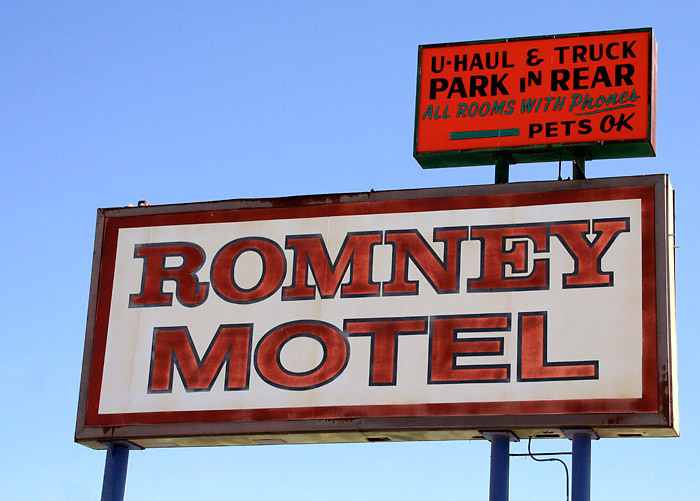 This and the following image from 2005 shows the Romney Motel, renovated in 2008. 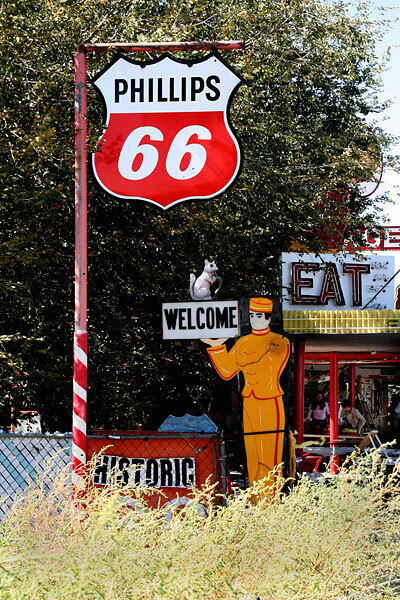 This 75 miles of Arizona road from Ashfork to Kingman has been designated Historic Route 66, and is the longest surviving stretch from the original highway. 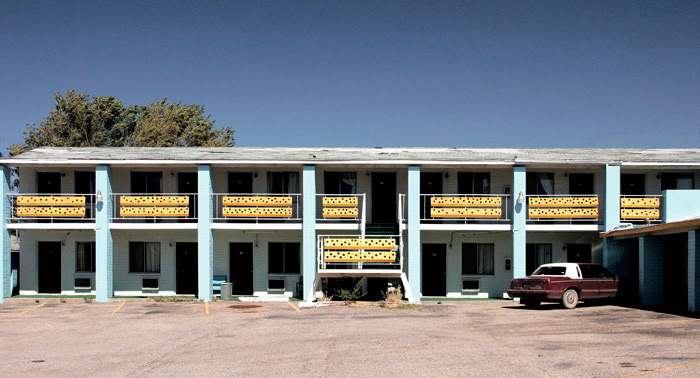 In 2005 Seligman was added to the National Trust Register of Historic Districts. 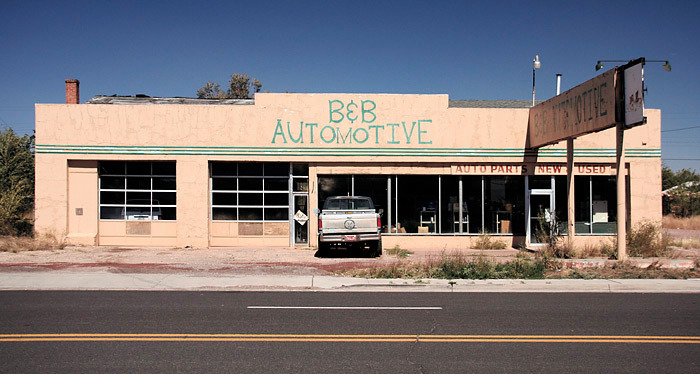 Under a bleaching mid-day September sun the temperature was into the nineties; B & B Automotive was deserted. 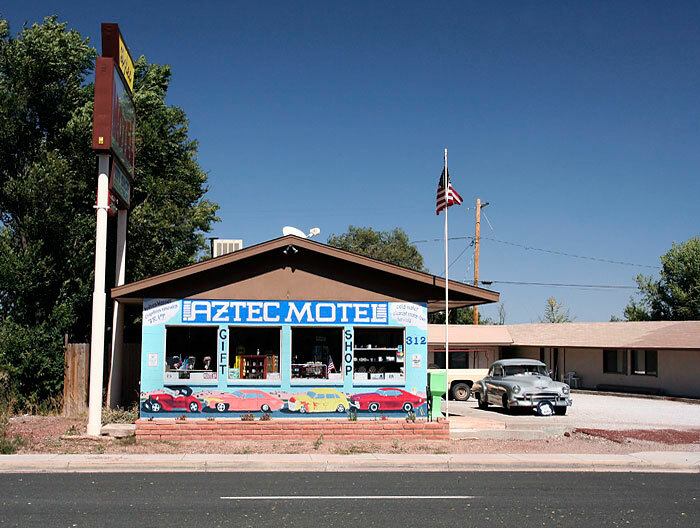 The Delgadillo family has been in Seligman since the 1920s and members have led efforts to preserve and promote the town. 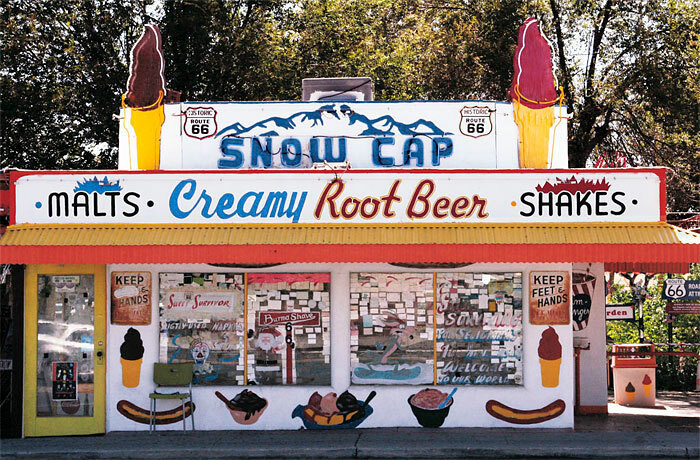 One of their businesses, the Snow Cap drive-in, was opened in 1973 and still provides food and humour in an idiosyncratic building. A collection of cars and all manner of other objects are gathered in and around the Snow Cap and this display approach is adopted by other town businesses. 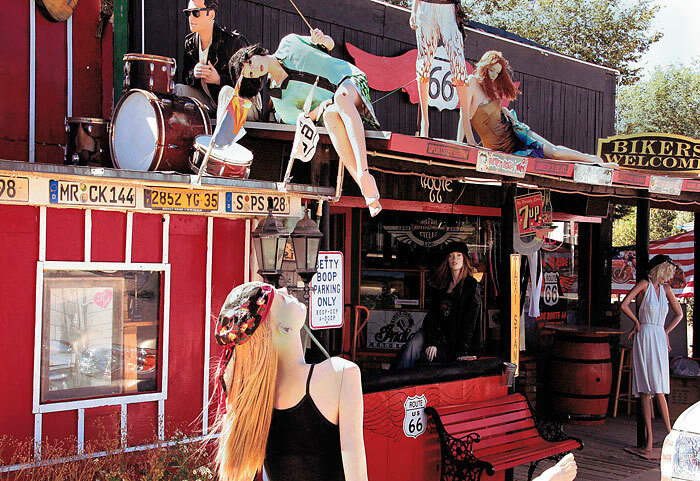 Active businesses compete to attract visitors, as does this café on Chino Street/Route 66. This and the following three images show the most inventive storefront one might expect anywhere. 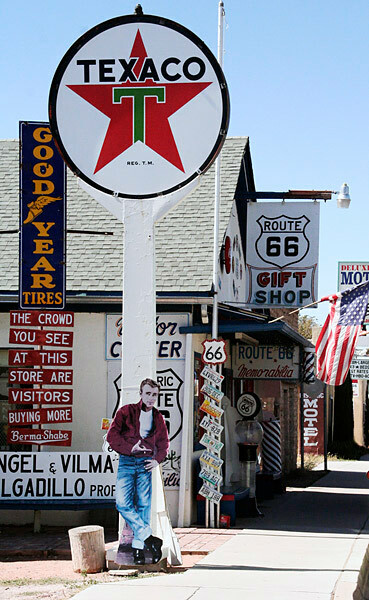 Most of its interior is devoted to Route 66 memorabilia and the remainder to biker boots and clothing. Angel and Vilma Delgadillo operated the Barbershop for many years, offering antiques, memorabilia and haircuts to locals and travellers alike. 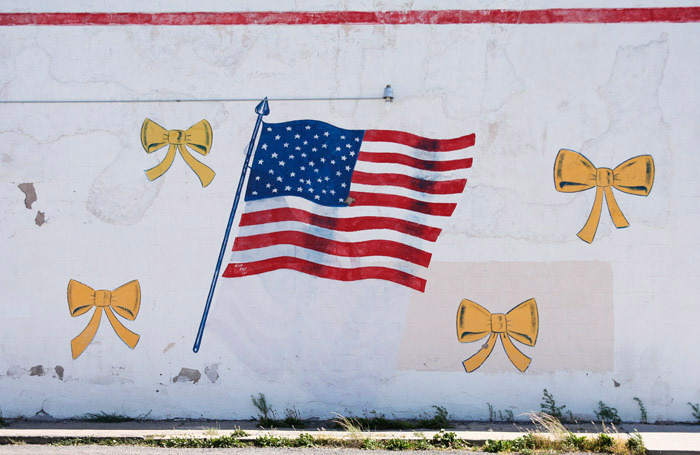 This mural was on the sidewall of a Chino Street store. The Cottage Hotel dates from 1912 and is in the Register of Historic Buildings; funds are being gathered for restoration. Built originally to accommodate cowboys and railway workers, it for some years housed a maternity hospital. Since construction in 1904 this building has served as theatre, dance hall, trading post and soda fountain with the added distinction of once housing the town's only telephone. 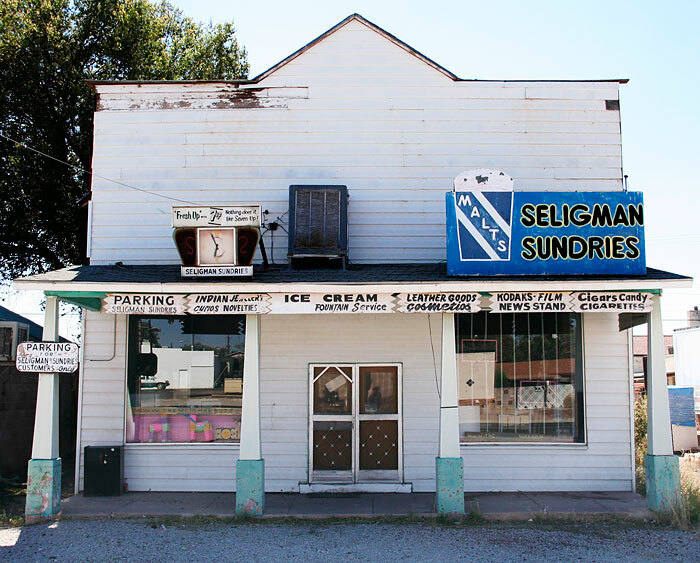 The soda fountain survives in the structure's careful 2007 restoration, renamed Historic Seligman Sundries. 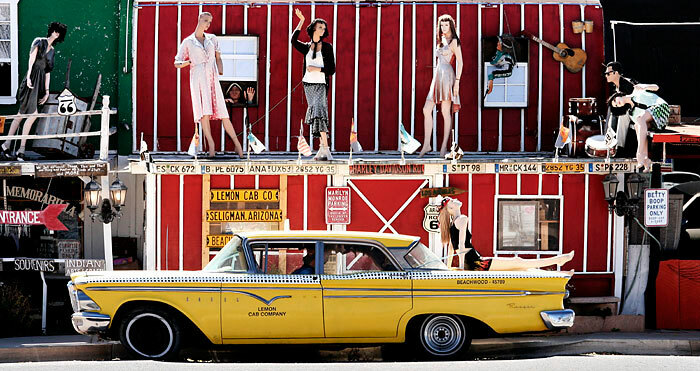 Images in both Route 66 galleries were made in 2005. Updated since in 2008, its painted frontage designs from 2005 survive in current advertising images, whilst wireless internet is one of the new amenities for visitors. 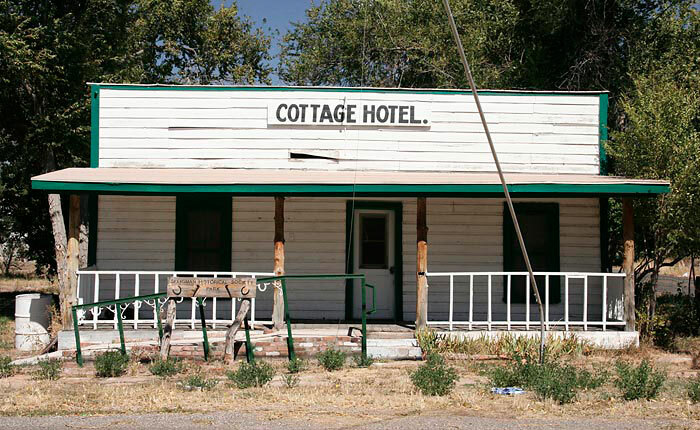 Long disused, the Havasu House was built by Fred Harvey, an immigrant Englishman, in 1905 as one of a number of hotels in towns along the Aitchison, Topeka & Santa Fe Railroad. Local efforts failed to save the building from demolition by the Burlington Northern & Santa Fe Railroad in 2008.